For thousands of years, Asia has been the population center of the world. But that’s about to change. 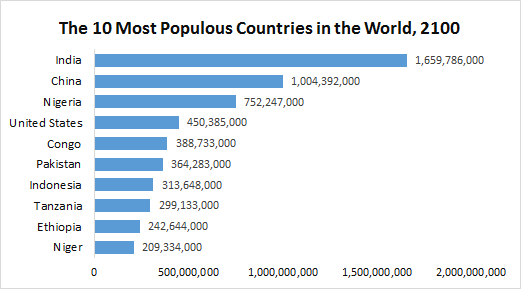 Asia contains 7 of the 10 most populous countries in the world, the two largest of which, China and India, each individually have larger populations than Africa, Europe, or the Americas. And as I’ve demonstrated previously, the eye-popping population density in regions such as Tokyo and Bangladesh is an order of magnitude greater than anywhere in the western world. Two hundred years ago, the figures were even more extreme. In 1800, nearly two thirds of the world lived in Asia. And at that time China had a larger population than Africa, Europe, and the Americas combined. Asia dominates the world population landscape, and it has for at least the last two and a half thousand years. As shown in the chart below, the relative population sizes of Asia, Africa, and Europe have remained surprisingly constant for thousands of years. Since at least 400 BC, 60% or more of the world has lived in Asia. By 2100, the population of Africa is expected to catch up with Asia. According to the U.N. Population Division, the population of Africa is poised to explode during the next 85 years, quadrupling in size by 2100. The U.N. attributes this change to two factors: Africa’s high fertility rates (African women have on average 4.7 children vs. a global average of 2.5) and its young population, many of whom will be reaching adulthood in the coming years and having children of their own. In order to account for uncertainties in estimating future fertility rates, the U.N. produces a range of population projections using different assumptions. The low and high fertility variants, as shown in the graph below, represent a 95% confidence interval. That is to say, the U.N. believes that there is a 95% probability that each region’s true population in 2100 will be somewhere between the low and high estimates. What I find most striking about this graph is not so much the size of the populations in 2100, but the rates of growth. While the populations of Asia, Europe, and the Americas are likely to have leveled out or be shrinking by 2100, Africa’s will be growing strong. If U.N. estimates prove correct, Nigeria, Congo, Tanzania, Ethiopia, and Niger will be among the most populous countries in the world by 2100. The interactive graphic at the top of the post is fully responsive and can be embedded using the code above (thanks to NPR’s pym.js plugin). Here is the map as an animated gif. Next Article How High Is the True U.S. Unemployment Rate? Great job! I like the animation of the cartogram. It overcomes the notorious disadvantage of cartogram that it distorts the original polygon shape making it difficult to recognize. Can you tell me how to make such animated cartograms? Thanks! Yes, I agree. Animation can make all the difference for cartograms. Sure, would be glad to explain my process. Will add a few notes to the post tomorrow. Great chart! Though I wish that people would stop using the Mercator projection for the base map. It’s especially misleading in this case, since it shows Alaska as more populous than Mexico, for example. An equal-area projection would be much more realistic. The Mollweide projection is popular, though I think that sinusoidal or Albers conical projections are significantly cooler. I would also not put too much trust in the UN’s projections for Africa. The evidence is pretty strong that birth rate is negatively correlated with income, and especially with female education. The remarkable progress in eradicating severe poverty suggests that birth rates in African countries, which are already not as extreme as they were a few years ago, are going to start plummeting to a degree that they can’t be ignored even by bureaucracies like the UN Population Division. Thanks for your thoughts George. – The initial (“normal”) map is WGS84, much flatter and less area-distorting than Mercator. Though at this stage, no mapping variable has been introduced, so the choice of projection is not really relevant anyway. 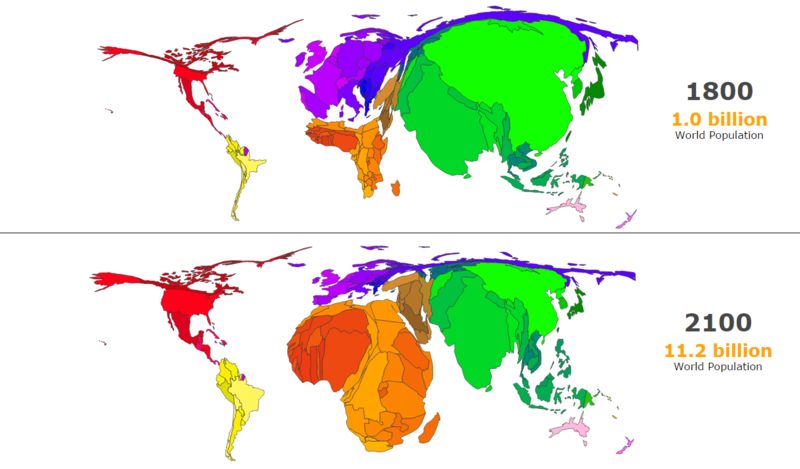 – The other maps are cartograms. By definition, the area of each feature is proportional to its population. That would be true under any projection, so I don’t see what could be misleading about it. If you are speaking specifically of why Alaska appears larger than Mexico, that is not because of the projection. It is because this map looks only at the population of countries (not individual states / provinces). So Alaska, Hawaii, the contiguous 48 states and every other part of the U.S. get scaled equally. This is further proof that Sub-Saharan Africa needs family planning programs on an enormous scale, and similar to what Asia attempted with great success in Thailand, Vietnam, India, Bangladesh, Indonesia and Iran. Bangladesh, Indonesia and Iran are especially instructive because these nations are highly conservative with their Muslim social mores, yet they were very successful in dropping fertility rates rather quickly within the span of 30 years or so. Their models would be instructive to the fast-growing Muslim nations in Africa. Christian nations in Africa, also highly conservative, would do well to emulate the drop in fertility rates achieved in Peru, Ecuador and Bolivia, three highly conservative Christian nations that managed to pull off this feat. Suffice to say, women all over the world, including highly religious and conservative ones in Sub-Saharan Africa, are avid users of family planning and prudent birth control. Studies have demonstrated that as urbanization rates start exploding–like they are presently in Sub-Saharan Africa–fertility rates start to fall rapidly because parents find it much more expensive to have many children in cities. Hopefully, Sub-Saharan is at that fertility rate inflection point soon because Niger cannot conceivably support 200 million people in its vast desert lands. The same goes for Ethiopia. Really good chance that we will see drought related famines and diseases that reduce African and world wide population sizes before 2100. I don’t see this happening with the huge increase in global temperature which is already showing effects today, lots of people will be leaving to cooler locations, half of India will look like the sahara by then. Africa doubles its population every 30 years. Just like clockwork. So 1.3 billion was 600 million 30 years ago and 300 million 55 years ago, ever since the introduction of Western medicine. So what is Africa going to do with its 1.3 billion additional people over the next 30 years?? Send them to France and Germany?? Or does Europe need a Confederacy of Dunces?